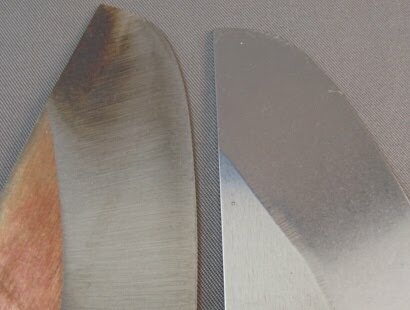 The process of taking a piece of hardened steel and grinding it down to the proper shape and design and then polishing it up to produce a high quality blade can involve multiple steps and lots of time and elbow grease (valuable labor). 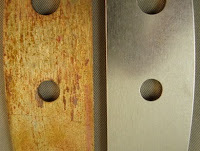 Once the basic blade shape is ground and stamped (see parts on left in both pictures), the hard work of removing grinding marks, oxidation and pitting on the surface and preparing the metal for a final polish begins. Mass finishing (vibratory tumbling in this case) was used to reduce the amount of hand work required and to allow for significantly higher through-put of the parts. 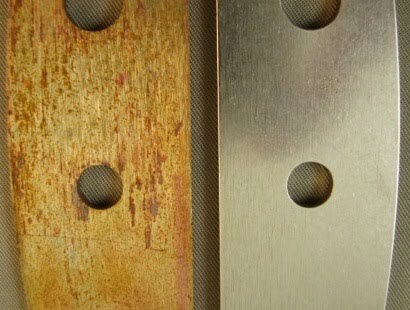 Multiple blades were tumbled at on time to achieve a smooth finish and then to begin the polishing process. The first step involved an abrasive tumbling media. Given the heavy grinding marks in this case, a fast cutting Ceramic Media was used. This step took about 2 hours to result in a smooth, matte finish. The second step using a Precision Ceramic Polishing Media was designed to begin to bring the part to a polished finish (see parts on right in both pictures). While not a high polish yet, the desire in this case was to use hand polishing to achieve the final mirror-like finish. Using a vibratory tumbling process on these parts increased the production capacity by at least 500% and dramatically reduced the time to produce each part.